Ralston’s PB37-30 pushbutton enclosures are designed to provide protection against dust, dirt, and oil for most standard oil tight pushbuttons, switches, and pilot lights. PB37-30 enclosures are also designed to provide extra depth, which may be required in some applications. 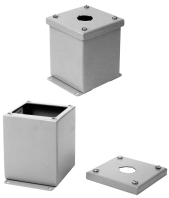 All PB37-30 enclosures are made from 14 ga. cold rolled steel and have continuously welded seams ground to a smooth finish. Each enclosure comes complete with grounding studs and wall mounting back brackets welded to the top and bottom outside. The door is prepunched with four-way pushbutton holes to accept 30 mm switches, pilot lights, and pushbuttons. The doors are sealed with oil resistant neoprene gasket and are secured to the sealed (blind) rivnuts in the enclosure with 10-32 captive screws. All enclosures are phosphatized and finished inside and out with ANSI/ASA 61 grey polyester powder coating. PB37-30mm enclosures are built to the requirements of NEMA/EEMAC Type 12 specifications for use with industrial controls in ordinary locations, and type 13 for an oil and dust tight enclosure. PB37-30mm enclosures are CSA certified (file #23608) and UL 508 Listed (file #136838) as a type 12 enclosure. Custom units made from stainless steel or with special finishes, sizes or punching can be supplied on order.